available vacancies in Himachal Pradesh SJVN Apprentices Recruitment are 270 posts. Candidates who are interested for these Apprentices jobs may visit the SJVN official website. Submit the filled application forms before the last date 10-01-2018. Applicant must have the age between 18 years to 30 years as on 10th January-2018. Candidates applying for SJVN Graduate Apprentices, Technician Apprentices jobs will be selected on the basis of marks secured in 10th and ITI or Diploma and Engineering Degree qualification. 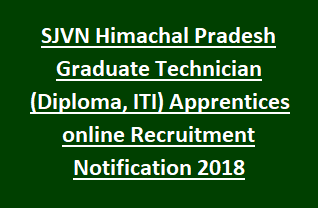 For more information of selection procedure, Application Process, age relaxations, Important Dates, stipend of Satluj Jal Vidyut Nigam Limited SJVN Graduate Apprentices, Technician Apprentices (Diploma/ ITI) 270 govt jobs Recruitment are stated below. Total Apprentices vacancies available in Satluj Jal Vidyut Nigam Limited SJVN recruitment are 270. 1. Graduate Apprentices: 100 posts. - Electronics & Communication: 01 Post. - Environment Pollution & Control: 01 Post. - Applied Geology: 02 Posts. - Information Technology: 01 Post. 3. Technician (ITI) Apprentices – 120 Posts. - Office Secretaryship/ Stenography: 03 Posts. - Electronics Mechanic: 15 Posts. - Office Assistant/ Office Management: 02 Posts. - Information Communications Technology/ IT/ Computer Assembly & Maintenance: 03 Posts. - General Mechanist/ Mechanical Servicing: 07 Posts. - Technician (Power Electronics Systems): 03 Posts. - Floricist (Floriculture): 02 Posts. Minimum age limit is 18 years and maximum age limit is 30 years as on 10th January-2018. For ST/ SC candidates is 35 years, for OBC is 33 years and for PWDs is 40 years. Graduate Apprentices: Degree (Full time) in Engineering / Technology in relevant branch from AICTE recognized Institute/ University. Technician (Diploma) Apprentices: Diploma (Full time) in Engineering/Technology in relevant branch from AICTE/ State Board of Technical Education recognized Institute/ University. Technician (ITI) Apprentices: 10th class Pass and 02 years ITI course in relevant Trade/ Branch (OR) 10+2 level vocational course in concerned branch/ Trade. Stipend for ITI Apprentices is Rs. 5000/- per month. For Diploma Apprentices is Rs. 8000/- per month. For Graduate Apprentices is Rs.10,000/- per month. Candidates will be shortlisted on the basis of marks secured in 10th and ITI/ diploma and Degree qualification. Shortlisted candidates will be placed on the SJVN official website. Candidates applying for Graduate/ Diploma Apprentices have to visit the SJVN’s official website www.sjvn.nic.in. Candidates applying for ITI Apprentices have to logon to http://www.apprenticeship.gov.in. Submit the online application forms before 10-01-2018. Application fee for general/ OBC candidates is Rs. 100/- and for others Nil.